Student Adventures: Microscopic wonders from a "Small World"
Can you imagine anything trickier than cutting the heart out of a mosquito? How about making an award-winning picture of that heart? A graduate student from Vanderbilt University has managed to pull off both of those tricks. 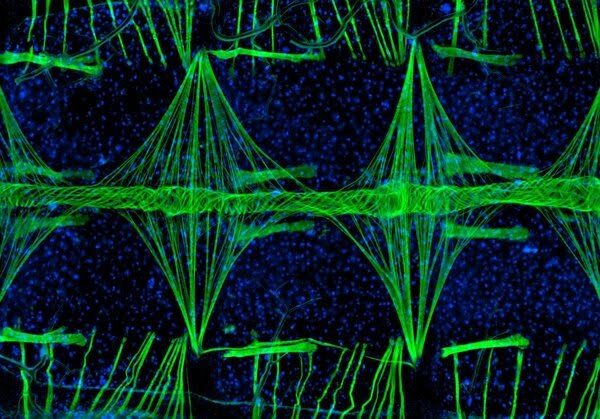 The image of the mosquito's tublar heart, supported by thin webs of muscles, was judged the first-place winner in this year's Nikon Small World photomicrophay competition--one of the world's most prestigious contests for aesthetically pleasing pictures of microscopic subjects. "We weren't really sure how well it was going to work," said photographer Jonas King, who worked on the project with his professor. "We were both just amazed at how cool it looked."